Whiteson, Leon and John Dale. "Barton Myers". The Canadian Encyclopedia, 11 April 2019, Historica Canada. https://www.thecanadianencyclopedia.ca/en/article/barton-myers. Accessed 22 April 2019. Barton Myers, RCA, FRAIC, architect (born 6 November 1934 in Norfolk, Virginia). Barton Myers is considered one of Toronto’s most influential architects, even though he hasn’t worked in Canada for more than 30 years. His architecture is notable for its activist stance on city design. He is passionate about the health of cities and the need to balance preservation and renewal. Much of his early seminal work in Canada is focused on mixed-use prototypes, infill housing and the sensitive combination of old and new to create richly layered urban environments. His innovative approach breathed new life into neighbourhoods slated for the wrecking ball and left a lasting mark on the city of Toronto. Exterior of the Citadel Theatre (architect Barton Myers with Rick Wilkin, 1975). Barton Myers graduated from the United States Naval Academy in Annapolis, Maryland, received his Master’s of Architecture degree from the University of Pennsylvania and immigrated to Canada in 1968 to join the faculty of architecture	at the University of Toronto. He soon became one of the city’s cutting-edge practitioners and educators. He co-founded and was principal of the firm of Diamond and Myers until 1975 (see also Jack Diamond), then founded Barton Myers Associates with offices in Toronto (1975–87) and Los Angeles (1984–present). Myers is an original designer with a strong sense of context and heritage; his projects range from houses and theatres to large urban developments. 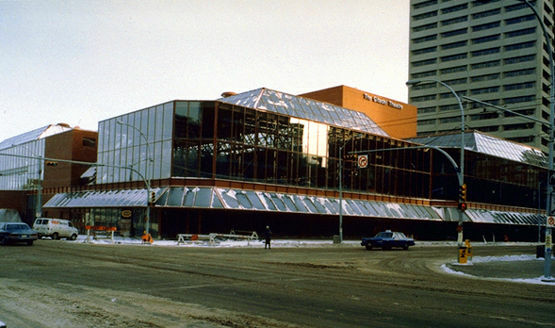 Notable projects include the Citadel Theatre and the Housing Union Building (HUB) at the University of Alberta in Edmonton; the Wolf House (called the house that most anticipated the 21st century in Canada), Sherbourne Lanes housing and the Art Gallery of Ontario, Stage III expansion, all in Toronto; the Seagram Museum in Waterloo, Ontario; the New Jersey Performing Arts Center in Newark; and his own house and studio in Montecito, California. Myers returned to the United States in the early 1980s to teach at the UCLA Graduate School of Architecture. He also led a team of designers and architects, which included Frank Gehry, in a mixed-use urban redesign of part of the Bunker Hill neighbourhood in downtown Los Angeles. Barton Myers was named a fellow of both the American Institute of Architects (FAIA) and the Royal Architectural Institute of Canada (RAIC). The 2002 recipient of the American Institute of Architects (AIA) Los Angeles Gold Medal, he is also recipient of the first Toronto Arts Award for architecture (1986), the 1994 RAIC Gold Medal and numerous AIA awards, including the California Council AIA Merit Award. He received Governor General’s Awards in architecture for the Citadel Theatre	and Seagram Museum (both 1986) and for Woodsworth College (1992) at the University of Toronto. The Prix du XXe siècle, an award for the enduring excellence of nationally significant architecture, was given to Barton Myers in 2007 for his design of Toronto’s Wolf House.